For finance professionals, proficiency in Excel is a fundamental part of the job description. Whether you describe yourself as a beginner or proficient in Excel, this course will take you to the next level and turn you into an advanced "power" user. We’ll start with the basics before we quickly introduce you to lesser known time-saving keyboard shortcuts and powerful Excel functions and features that you can immediately put to use on the job. The only way to learn Excel is by doing, so you’ll be completing Excel exercises every step of the way. Accelerate the internalization of the key time-saving shortcuts via exercise-based internalization drills and video-driven guidance. Learn how to incorporate and take advantage of the most popular and helpful Excel functions and table features for financial analysis. Learn to quickly create macro-based shortcuts. Build data tables and perform sensitivity analysis. Enhance the presentation of financial and valuation models by adding forms and toggles to your spreadsheets. 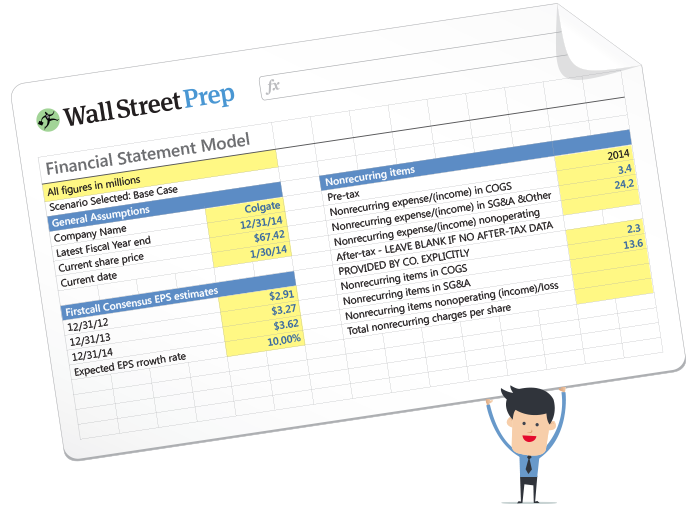 Wall Street Prep's Excel Crash Course is used at top financial institutions and business schools. Excellent for those who are motivated to increase their Excel functionality. The videos along with the step by step course manual, Excel practice sheet, and drills you offer allows me to learn the same material in more than one way which I feel has helped most of the material to stick with me. This course has helped so far in my current position because already I have been teaching co-workers certain shortcuts and tricks I have been using. I have gotten staffed on two projects now simply because I can function in Excel better than others, and personally it has given me more confidence in my capabilities to work in Excel. 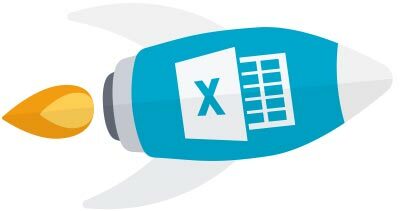 I am not normally one to write reviews, but this Excel Crash Course deserves one. The videos were high quality and you did an excellent job of explaining everything. My main goal was to brush up on my excel skills for a couple of technical job interviews, and this course was perfect. I am 1.5 years out of college, and this course taught me more than anything I learned in school. My excel skills are stronger than ever, and I loved learning all the hotkeys. I chose WSP on the recommendation from a friend, and I have already been telling all my friends they need to take this course. It helped me a great deal in my interviews. My main goal was to become a more efficient and effective Excel user, and to refresh some of the concepts I learned in school that had gotten a bit rusty over time. WSP was the only provider I considered, the clientele of WSP speak for themselves and assured me of the quality of the training. I couldn't be more satisfied with this course. I've been able to attain a level of proficiency in Excel I never thought I would have. I've recommended this course to several friends and co-workers, I can't say enough good things about WSP. I believe this course will help to set me aside as a proficient user of Excel, and to differentiate me from my peers. Very few people at my place of work can use Excel above a basic level, so I think I will noticeably stand out. I was switching my career track from economic analysis to more finance oriented work. I found that my lack of proficiency in Excel was really slowing me down in financial modeling, therefore I enrolled in your course. It is very concise and very well integrated with the financial modeling skill sets.I have gotten way faster with Excel and discovered a lot more functionality. Excel became a more important tool in my day-to-day work. I also got more confident with finance interviews. I am currently working as an independent financial advisory in Shanghai and am looking to make a lateral shift in a more technically driven role. I can already say that I am 10x more confident in my excel abilities which I am sure will superpower my next career step. I bought this while working as an assistant to financial advisers because I needed to learn to run analysis through excel quickly. It dramatically increased my excel knowledge, which has enabled me to take on more analytic work and impress my boss. The Excel Crash Course is amazing! I already feel more confident and efficient in the workplace. My main goal when I bought the Excel Crash Course was to strengthen my existing excel skills and become more familiar with the parts of excel I already know, and to learn the skills I didn't have yet (such as VLOOKUPs). I really enjoyed the course because the instructor in the videos made the information easy to grasp. I like that there were additional documents attached so that we could do the exercises ourselves. I now feel more comfortable doing everyday tasks on excel. Due to the fact that I am in business, I will be using excel quite often, so the fact that I had the opportunity to learn more about excel (and have access to the videos for future reference) has helped me out tremendously. I have learned a lot of useful formulas, formatting tips, and shortcuts (i.e.) macros that save me time and ensure my work is consistent! I like the course! The pacing is comfortable, the explanations are straightforward, and the exercises are useful. Overlaying the shortcut keys is super helpful to have that information sink in. Comfort in excel and prep for the financial modeling boot camp. I am a young professional, up for consideration for a more technical position within my company. I chose WSP over other training providers because there are positive reviews of the course online, and when I mentioned these courses to my development manager, she confirmed they were respected in the field. The main purpose for doing this program was originally as a refresher but moreover, to gain a firm grounding in the best practices that the industry is currently using. After perusing the course content of other facilitators, Wall Street prep was the closest in terms of accessibility and portability, student focused oriented and its comprehensive exams to ensure that learning has indeed taken place. This course has strengthened and built my confidence in pursuing the premium package offered by your institution which will propel me towards my goal of becoming a portfolio manager . I've recently graduated and I am just beginning my career in investment banking. I am now much more proficient in Excel! This course has also prepared me for starting my first job in energy M&A. It was absolutely fantastic, best $39.00 I have ever spent in my life. Incredible value. I like that the lectures are given by a person with a lot of finance experience who provides insight as to how best use Excel from a professional point of view. In contrast, a lot of other lecturers focus only on Excel features and not on best practices. I became much more efficient at work and hopefully, this will give me competitive advantage in my upcoming interviews. Overall, I really loved the course and have already recommended it to many people! Very helpful! I am in a training manager role for a company and have recently had to create excel based reports as part of my regular day, so I needed a review. This course helped me to be more efficient with my time. I bought this course to prep for an upcoming interview for a performance analyst position at the bank that had an excel test component. I only had few days before the interview so I was looking for something comprehensive but that didn't take months to finish. Your course helped me to pass the job interview and get the job offer, as some of the excel questions in the interview involved concepts that I learned from the course (eg. sumifs). Great course! It helped me pass a job interview test. By way of background I'm a Managing Director with a lower middle market investment bank, which is a Finra Broker/Dealer. I’ve been in the investment banking business for 13 years after a long career as a C-level executive. I have taken WSP’s Financial Modeling Course in the past. The course was very comprehensive, well taught and presented and thorough. So the Excel Crash Course was a natural for me. I liked the Course. Over time we get into a rut in terms of how we use Excel. Your course opened up new functionality and better ways to use Excel in my work. We are constantly trying to improve our level of service to our clients. Having robust, sophisticated financial models that articulate the value proposition of our client’s business is critical. WSP’s Excel Crash Course helps us to provide this service. I am an analyst at a boutique and in addition to my many analyst duties I've been tasked with structuring our summer internship program. I purchased the course to prepare interns for our program and make sure they have the necessary skills prior to joining. (Our head of Equities stated his biggest challenge with interns is they generally do not have solid excel skills and hence take a long time to complete tasks that can be accomplished quicker with shortcuts/formulas etc). Great course and great content! My experience overall was positive. I’m almost 7 years into my career and each position I’ve held hasn’t been Excel heavy until now, so I wanted to advance my Excel knowledge. The more I can do in Excel, the more beneficial I am to my team. My manager brought this course to my attention as he knows I want to work on my technical skills, and one of my colleagues took the course and had all positive feedback. The course was great. I’ve already started to put it into practice so I won’t forget anything that was taught. Technical skills are something I am working on so this helps in my development objectives and I can assist colleagues in some of their day to day functions. I bought this course to gain a better understanding of Excel's capabilities before I go into grad school/full-time employment. The course gave me a full immersion into Excel for 39 dollars! It was pretty high value, and it has given me more confidence in interviews. I enjoyed how it starts with basic level and then proceeds into an advanced excel functioning and features. This is an excellent course and I highly recommend it for those who want to improve their Excel skills. I have recently finished my master. My main goal was to get quicker with excel and take advantage of the shortcuts. The price (cheap), the international recognition and all the different topics covered on the course make this course different and helped me make my decision. It is a great course to reach a professional level on excel if you work on it. 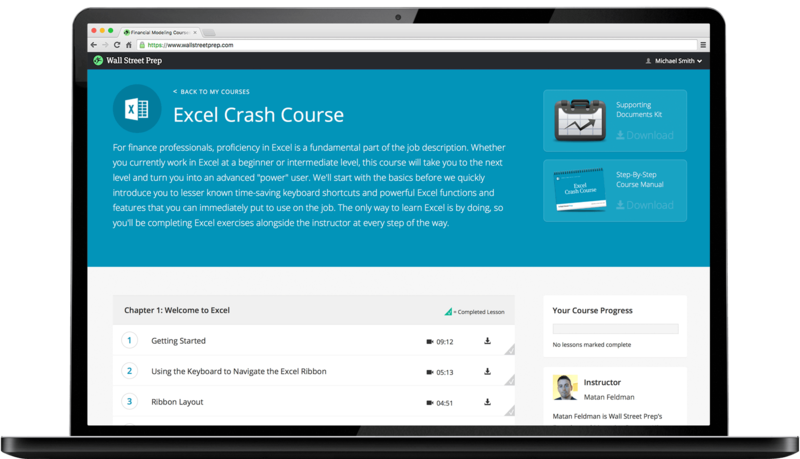 I took the Excel Crash Course because I wanted to know and understand functions and formulas as well as how to build dash boards and be proficient in excel as my work requires this. The deciding factor when choosing WSP was the structure of the course was the main thing. Its easy to follow. I liked the course, I've learned so much, however I wish there was a course specifically for Mac users. I started this course last year when I was doing my MBA. Because of the proficiency I got I managed to apply for an operation coordinator position at Uber South Africa which I got. I'm grateful. I knew nothing before the course and now I do a job that is excel based. Excel crash course was great! Took me about a week to get the hang of it. Now I'm a Microsoft office weapon. I liked the idea that the person who created this was an analyst like me, someone I could view as a peer and that I could trust the information provided to me. I was drawn to his course as a refresher but I definitely learned plenty of lesser known shortcuts and proficiency tips that have greatly helped me. This course was definitely excellent. I was looking to refresh and enhance my high-level Excel skills and identify any tips/tricks I was missing. I am constantly using Excel, so getting faster and improving the quality of my worksheets/models helps me perform at a higher level. The course was definitely worthwhile. I liked the hands-on, step-by-step approach that Matan uses in his tutorials. It was important to me that I could comprehend the material as I progressed through the course – the printable manuals are a real asset as well. This course literally shortcuts you to the core functionality of Excel. I was able to work more effectively and efficiently both in modeling and auditing the models. I just graduated in Finance and I needed to hone my Excel skills in order to succeed in the finance world. The course was easy to follow and going forward in interviews I can confidently say that I am proficient in Excel. My goal was to get hands on experience in Excel and achieve proficiency. I finished my Master’s in Economics but I didn’t have the work experience of using Excel. I chose WSP because they are actually training investment bank’s new employees, so it’s very relevant to the real world. The course is very well designed - easy to follow, easy to learn with a lot of exercises. The functions are introduced in real scenarios that is related to work, making it very practical. The course was easy to access and the ability to learn at my own speed was the most important part. I found it extremely easy to learn and thought it was very well taught. It will definitely advance my professional goals. I wanted to become sufficient in Excel to the point of not needing to use a mouse to assist with my summer internship in Corporate Development. I found the course to be very useful and thought the pace was perfect, the explanations are easy to follow and I like the comments section. I am definitely much more proficient with Excel and anticipate being able to efficiently use my knowledge of Excel commands building out models. My main goal in purchasing the course was to gain the Excel skills necessary for analytical positions in finance. What I wanted was a comprehensive approach on Excel’s foundations and not simply an ad hoc list of helpful tools for a specific type of task. The course is truly unbelievable. I would recommend it to anybody, including companies who want to train their workforce in Excel. I loved the verbal instructions and explanation of key excel elements in particular the functions. The supplementary practice material was very helpful. I benefited from being able to pause the recording and work on the answers in my own time. This also allowed me to fast track the areas that I picked up quickly and spend more time on the areas I found a little more challenging or those which I know I will need to be very familiar with for my job. I feel confident that I will be much more efficient when using excel and as I move into more complex models I will understand how to use the various functions. After spending weeks reading all I can on the various financial modeling courses in the market, I ultimately chose WSP after reading comments from previous students who claimed that WSP is more analytically rigorous versus other providers. In terms of structure, I appreciated the fact that the course progressed linearly from discussing the basic layout of Excel to the more advanced topics focused on working and making sense of data. I believe such a structure is a boon for students who may not had much exposure to Excel prior to signing up for the course. I have applied WSP’s suggested best practices in my internship and the manager I am working with has complemented me on creating clean and easy to understand Excel files. That’s all thanks to you and the WSP team! My main goal is to become an outstanding excel modeler and to clarify some things I’ve learned in practice. The deciding factors for this course was the reputation of WSP and the applicability of the topics. One of the best parts of the course is the fact that I can come back to the materials whenever needed. This course has made me more marketable within and outside my firm, and most importantly, more confident on my modeling skills. My main goal was to refresh myself with Excel at a high level, learn new techniques and to be able to use a higher level functionality to increase my efficiency, improve technique and get the most out of Excel – for this the $39 price-tag as compared with other offerings and their corresponding presentation and content is a very good value. The structure of the course was good, the order of presentation was logical enough to sufficiently built up to skill level. In terms of my professional goals – it has increased my efficiency and my scope of ‘imagination’ in terms of thinking about how to approach new projects, existing projects and other ways I would like to use Excel. I can say that I definitely have a higher degree of confidence in terms of how I will execute. I decided to enroll in the Excel Crash Course because I knew how crucial Excel was and that I needed to get advanced knowledge. WSP taught me how to use Excel in a simple, direct and effective way, teaching me not only how to memorize commands, but also how to apply the "Excel mindset" for any situation. It didn't take many days to see the difference that the course had made. It takes me much less time to deliver the same results on tasks I do everyday. I regularly review models built by others and often make decisions based on them. My goal in buying the course was to ensure that I felt confident in reviewing models built by other people. I chose WSP because I liked the content and the format of the online courses. I have found that my confidence in reviewing the work of others has improved. I also use many new shortcuts and now find myself rarely using the mouse. I wanted to improve my knowledge of formulas/functions within Excel to increase application efficiency. The self-study, online format was effective. Material progressed from easiest content to more difficult. I had no formal training in excel/modeling, so this course has progressed my capabilities in a professional application. My main goal was to develop a more in depth understanding of Excel to enhance my analytical ability. WSP was recommended to me by colleagues and as I had unsatisfactory experiences in other courses, I chose WSP on their recommendation without hesitation. The step by step videos made the material very easy to follow. I liked that it was offered with a manual that I can reference in the future and a cheat sheet of shortcuts. The course has helped advance my career goals by giving me the confidence and knowledge required to perform more complex Excel workflows. I am a mid-career professional in commercial/corporate banking area and I bought the course to improve my Excel skills and to later learn more about financial modeling through the Premium Package. The deciding factor was the repute of WSP. The course provided excellent methodical explanation, with follow up exercises and tests. It has helped me to learn more about excel and modeling, an absolute requirement for any commercial/corporate banker. My main goal was to get some powerful knowledge, I was no novice about Excel but I definitely lacked better practices and powerful formulas and functions. Since completing the course, it has helped me to do my worksheets faster with a lot of shortcuts and to use formulas I didn’t even know existed.